Ring blocks can be used to block separate brims, which can then be cut to a wide variety of shapes, from bowler to Breton. It is also possible to block a one-piece hat by first blocking the crown on, say, a CB2 bowler block, putting the ring block over the blocked crown, supporting it at the required height near the bottom and blocking the brim over the ring in one piece with the crown. If you intend to use a ring in this way, order one that is three quarters of an inch bigger than the crown to allow for up to 3mm thickness of fabric. 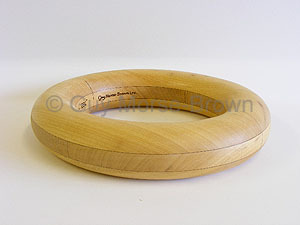 Please note that our ring blocks may not fit over crown blocks made by other manufacturers.